Whether you call it a bug-out bag, survival kit, get home bag, or a “possibles” bag, the purpose is the same: to get you from Point A (your job, for example) to Point B (home or another safe location) in relative safety. Articles too numerous to count have been written by various and sundry experts about the contents of a basic survival kit. The common things found in one are: food to last a couple days, water (and the means to purify more), first aid supplies, and methods to light fires. Expedient shelter materials, such as an emergency blanket, a map, and a compass are often included as well. Once you’ve covered the basics, it is time to look at those items that might not be absolutely critical to survival but sure make life much easier when you’re dealing with an already stressful situation. The assumption usually made when discussing bug-out bags is that you will be on foot during your journey. While this might not end up being the case in your particular situation, I think it is safe to say traveling by shank’s mare is likely the worst-case scenario and thus the one to have in mind when assembling a bug-out bag. Most of the following items are fairly small and will fit into all but the tiniest survival kits. Many of them are very inexpensive and can be found at your local dollar store. Where I live, the mosquitoes are large enough to qualify as single engine aircraft. Therefore, some form of good insect repellent is a necessity when outdoors. While Murphy’s Law dictates you’ll be bugging out in the nastiest weather imaginable, you could luck out and have it be nice and sunny. If that’s the case, you’ll want sunscreen to prevent uncomfortable sunburns from developing. 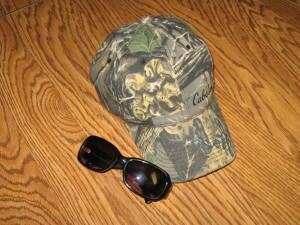 Sunglasses and a wide-brimmed hat are also essential. If you have prescription glasses, consider getting an older pair tinted to use for sunglasses. A cheaper alternative would be to purchase either clip-on sunglasses that fit over your current ones or the large sunglasses often given to eye patients. Remember, bugging out isn’t a fashion contest, so don’t worry about your appearance. Keeping the sun out of your eyes is essential when traveling on foot. As anyone who spends a fair amount of time outdoors can attest, chapped and cracked lips are no fun. Toss a tube or two of lip balm into your bug-out bag. Heavy-duty work gloves will be welcome should you need to clear an area for your campsite, snap branches for firewood, or build a quick debris hut shelter. Even a small cut could quickly become infected out in the field. Spare socks and underwear can be a Godsend. You may end up getting soaked in a sudden rainstorm or wading through an overflowing drainage ditch. Having dry socks will help you stay on your feet after you’ve dried out a bit. Keep them in a sealed plastic bag so they’ll stay dry until you need them. For cleaning up, a small packet of baby wipes can’t be beat. Add in a small bottle of hand sanitizer and you’ll feel almost human again. Consider packing a small cloth dish towel for drying off hands and such. You can fit a roll of toilet paper into a small plastic bag by removing the cardboard tube and smashing the roll flat. When it comes to versatility in use, it is hard to beat good, old duct tape. With it, you can repair clothing, patch a hole in your emergency blanket, even remove a splinter. The problem is that a roll of duct tape is large and heavy. You can cut down on size and weight by re-rolling the tape onto a pencil. And since you’re already packing a pencil, be sure to include a small notepad. Being able to jot notes to yourself can help keep you from getting lost. You may also feel the need to leave notes for others so they know where you’ve been and where you’re headed. Another great tool for expedient repairs are hot glue sticks. Just heat the end with your campfire or a lighter until it gets soft, then smear it on the area needing repair. Be careful you don’t burn yourself though. Use a small twig as a paint brush if needed. Glue sticks and paracord have innumerable uses. Paracord is an incredibly useful addition to the bug out bag. For those not familiar with it, paracord is a rope that consists of seven nylon strands covered in a shroud. 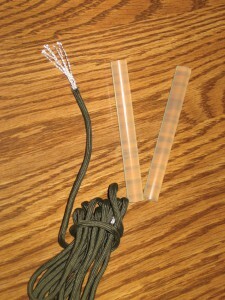 Paracord is thin enough to use as replacement shoe laces, yet strong enough to support the weight of a full-grown man. It is useful when constructing a shelter or lashing items to your pack. 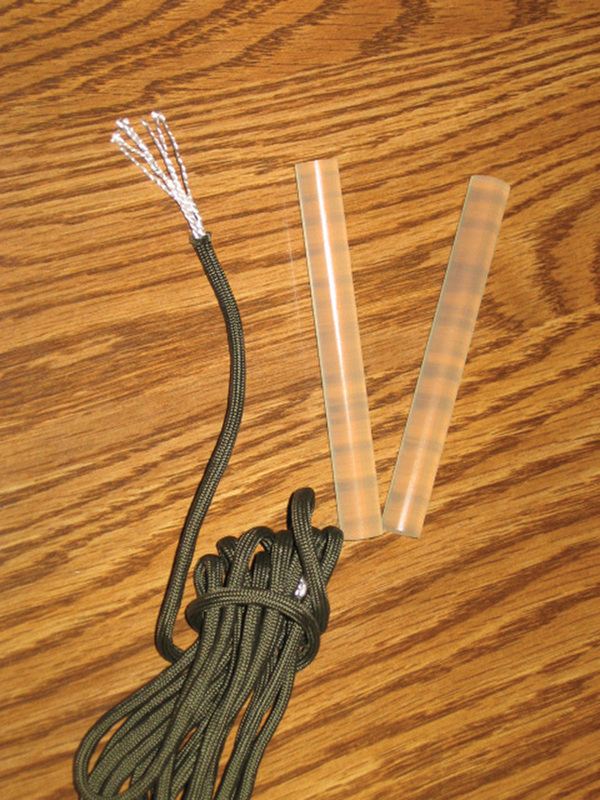 You can also remove the nylon strands individually to use as fishing line or another purpose. This is one item that you won’t find at the dollar store. It is available at many military surplus stores as well as online. Although a flashlight is often included in the basic content list for bug-out bags, consider adding an LED headlamp to your kit. This will be of great help in any number of situations, including answering nature’s call after sundown. For Christmas a couple years back, my wife gifted me with a baseball cap with LED lights built into the brim. 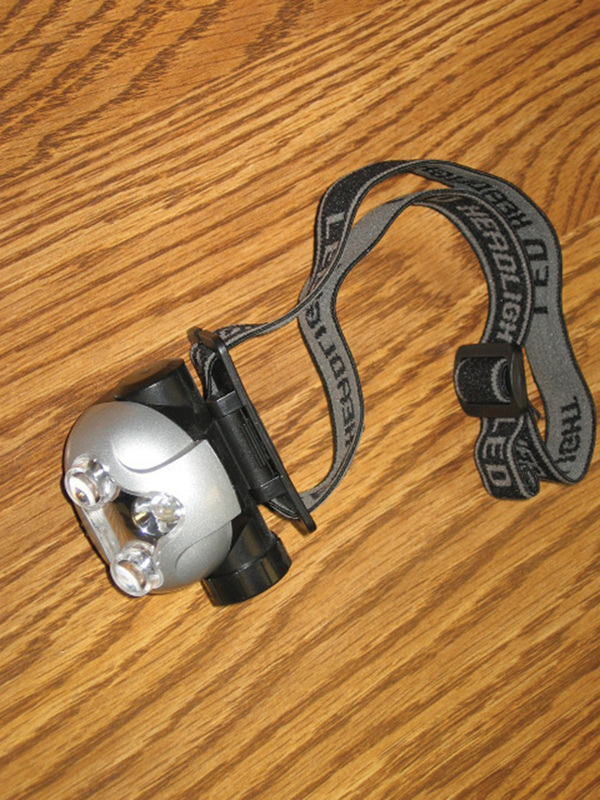 LED headlamps are often more useful than flashlights. I use it all the time when night hiking as well as when doing chores around the house. It truly is one of the few gadgets that make you wonder how you went without it for so long. Having a few extra ziplock plastic bags will come in handy when gathering tinder or scrounging wild foods during your bug out. Along the same lines, if you’re not intimately familiar with the edible plants native to your area, consider purchasing a good-quality guide for your kit. Again, these items may not be essential, but they will help make life easier during a bug-out situation.